I found RVR when I took a scenic route home from Madison one year and was really impressed on my visit. I haven't actually been back since that summer, so its been three years. RVR is the oldest mushroom farm in the Midwest. Dating back two generations to '76, they grow all sorts of mushrooms there at the farm and sell them fresh at the country store located on the farm. Im sure that many people have seen them at various farmer markets throughout Chicagoland and know they carry a wide ranging selection of fresh shrooms. With all the mushrooms grown, they have to put them to use in ways other than fresh picked and they do that by offering all sorts of wonderful pasta sauces, dip's and pickled relishes but there most amazing product doesnt even include mushrooms...the five cheese spread, hey this is a mushroom farm in Wisconsin. When I bought a jar of this upon my visit, I had no idea about the fiendness it would cause me. This five cheese spread makes the greatest cheesy garlic bread you will ever consume. It lasted for maybe three weeks and I haven't had any since though ive had many hankerings for it, I couldnt remember the name of this place for the life of me so I had no way of acquiring more, until now that is. I realized the farm was in Wisconsin and not Illinois which is how I had been looking for it. According to their website they now offer the spread in Chicagoland locations where there other products are sold. Ill be calling around tomorrow to find some. Chicagoland style poor boy sandwiches for dinner this week. I know Sam's Wines & Spirits used to carry their five cheese spread (which is delicious) along with a few other products and probably still does. 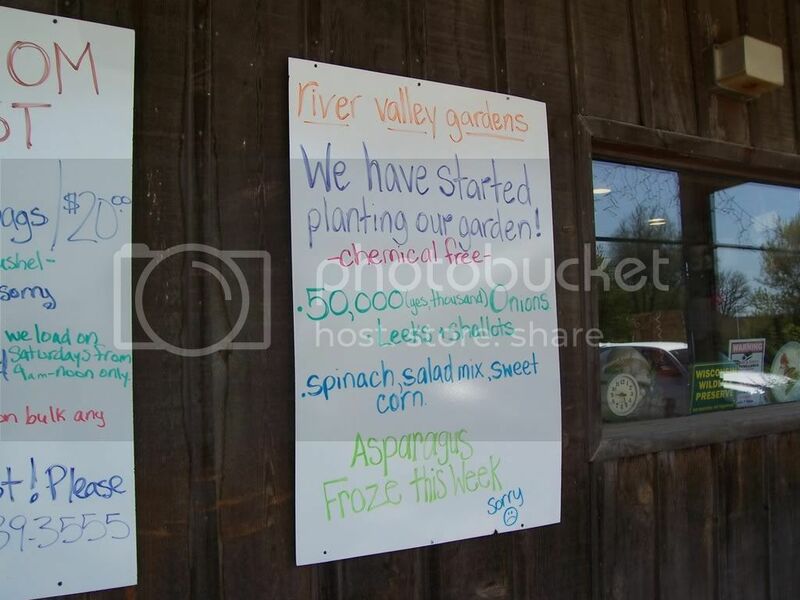 Also, in past years River Valley Ranch has had a booth at the Green City Farmer's Market which opens May 14th. Hope this helps is your search! There was an interesting discussion of RVR here. I found the 5-cheese spread at Binny's on Dempster in Skokie just this morning. I believe that this mushroom farm used to be located four miles East on Hwy 50 in New Munster. Was that the same operation? Doesn't Slades Corners have a post office? Judy wrote: I found the 5-cheese spread at Binny's on Dempster in Skokie just this morning. I bought this the first time at the Public Market in Milwaukee. We were hooked! Tried to find it on line to no avail. Was happily surprised to find it at the downtown farmers markets. They do not sell it over the internet because it must remain refrigerated. At the markets they sell it frozen. Thaws out just fine and keeps for a year frozen. I am down to my last jar. The Federal Plaza Market begins May 13 and the Daley Plaza Market on the 15th. Just in time to restock! Last year the price was $7/each or 3/$20. I paid $8.69 for it today at Binny's. I don't know if all the Binny's stores carry it, I've only seen it at the one in Skokie. I also bought a loaf of Boudin sourdough bread then went straight home and made garlic bread! It was awesome! The family who founded River Valley Ranch mushrooms were once in the restaurant business. The father of the current owner wanted fresh mushrooms and decided to do it himself. For one summer. I answered food preservation questions at the Ravinia Farmer's Market. I often parked myself next to the RVR location manned by the founder's widow. She was not happy with the mushroom business now run by their son and often complained they were loosing their shirt. I recently learned the turn around in RVR's fates was when they began pickling mushrooms. They brought in local women who canned their mushrooms. This value-added product was the beginning of their profitability. Eventually the women didn't want to work as hard as was necessary to produce these pickled products. The impression I got was the son now has a custom house make his pickled products. THis product and their presence at farmer's markets have made this a profitable business. Sunday was a great day so we decided to drive to River Valley Ranch with a stop along the way at Glacial Park north of McHenry for some birding. RVR is pretty easy to find and it's helpful that there is a stoplight there on very busy Wi Rte. 50. We did not buy any portobella brats, my partner is vegetarian and their main ingediant was pork. We did buy Portabello and Leek cheese, 5 cheese garlic spread, mushroom spread and several bags of mushrooms. 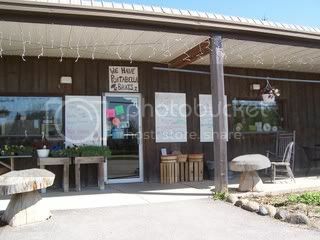 Their store has a huge range of mushroom based products, local cheeses and other early sping produce. You can see that they lost their own asparagus crop but we did buy some that they had from another farm. We would have bought some mushroom compost but ran out of room. 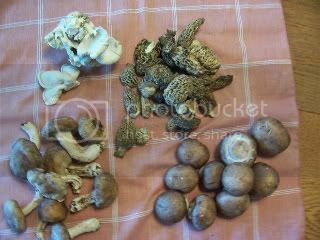 This is what came in the "mixed" bag that we bought for $5.50., shitake, oysters and small bellas. The morels were seperate and were $10. We had lunch in Burlington at a pretty undistingused place called the Charcoal Grille. I had a blue cheese burger that came way too cooked and dry though I ordered it rare and my partner had what was called a Wisconsin salad that came with blue cheese and cranberries. There was a Sunday brunch going on but it didn't seen too great.